We will host an exhibition of original paintings by Delaware artist Alissa Rosenstein from April 13 through May 11. The exhibition begins with a reception from 5pm-8pm on Saturday, April 13. The reception, open to the public, offers an opportunity to meet with the artist, view her paintings, and enjoy some Links Bridge Vineyards wine. Light hors d’oeuvres will be served and reservations are not required. 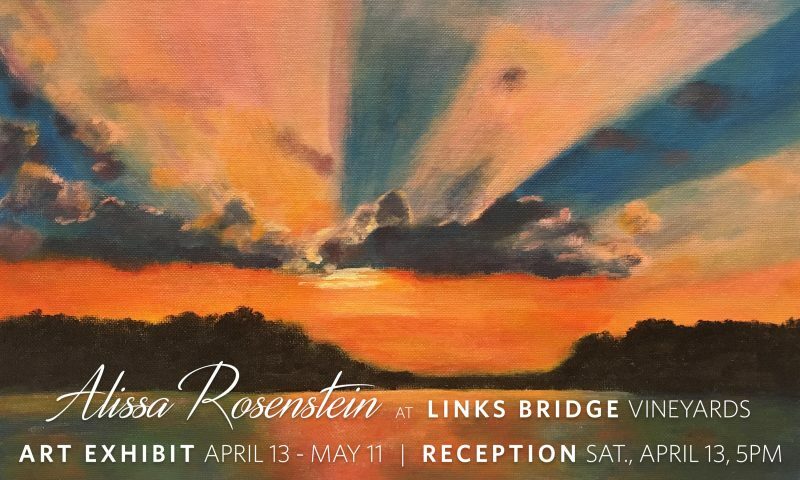 Rosenstein’s paintings focus on scenic views, particularly bright and colorful sunrises and sunsets over the coastal Delaware waterways and countryside scenes of Frederick County, Maryland. She is especially inspired by the play of color and light over water. Rosenstein, a graduate of Towson University, grew up in Montgomery County, was a long-time resident of Frederick, and now lives in Delaware. She is Production Manager for Delaware Beach Life Magazine and owns a freelance graphic design business. She returns frequently to Frederick to be with family and friends and still considers it home. She is an avid hiker and bike rider and hiking the trails of Frederick County with her father is a favorite recreation. Delaware artist Alissa Rosenstein will exhibit her paintings at our tasting room from April 13-May 11. Come by on April 13th, 5-8pm, to meet the artist, see her work, and enjoy a little Links Bridge Vineyards wine. See our “News” page for more info! March is Maryland Wine Month! There will be a lot going on this month at wineries around the state. See our recent post under “News” to find out more about Maryland Wine Month. We hope you’ll sign up below to subscribe to our newsletter. We won’t bombard you with emails, but will occasionally let you know what’s going on here. © 2019 Links Bridge Vineyards. All Rights Reserved.